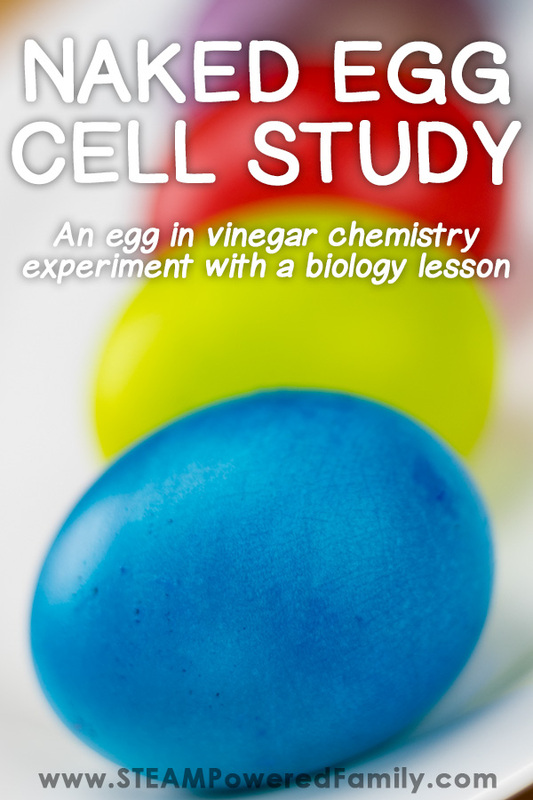 Did you know you can study cells by examining eggs? Chicken eggs are essentially one big cell making it much easier to study than the teeny tiny cells that make up our body. With this cells unit study on cells we examined raw eggs to learn about their parts. This was a great introduction into the concept of the cell, but we decided to take our study of the egg up a notch. 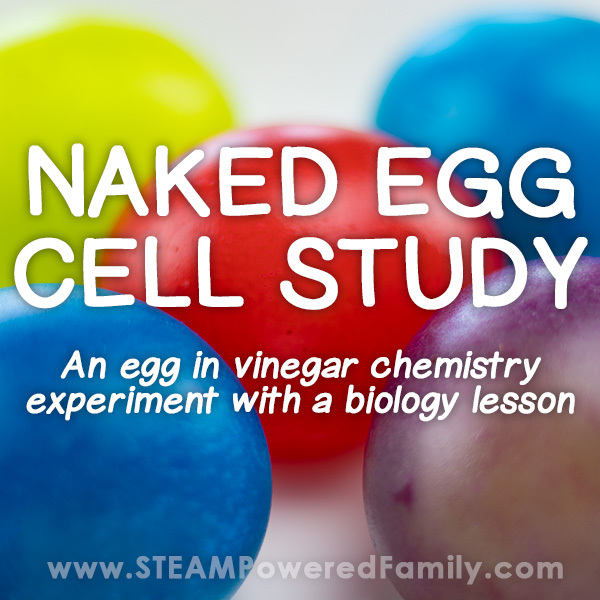 It was time to do an egg in vinegar experiment and the always fun naked eggs study. To start off our unit study we discussed cells and how they make up all living things. Then it was time to get hands on! We decided to bring some chemistry to our biology lesson and do an egg in vinegar experiment. 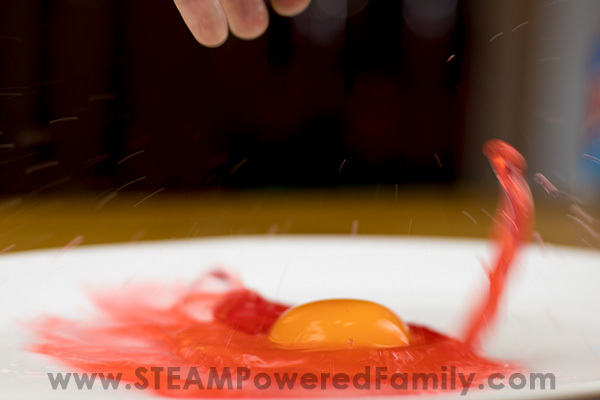 With this experiment we are able to remove the shell of a raw egg with a chemical reaction, leaving us with a naked egg. The inside of this naked egg provides an excellent opportunity to study cells. We kicked things off with each child taking an egg and exploring. We encouraged their curiosity as they explored the shell, how fragile the egg shell is, and what it looks like when cracked open. Surprisingly, we were able to remove some of the shell from one of our eggs revealing the membrane! This made the kids even more excited about our experiment to create naked eggs. Start by testing to make sure your eggs will easily fit into (and out once enlarged) easily. I recommend using wide mouth mason jars for at least one of the eggs so kids can really see the reaction. But if you want to do lots of eggs you can do them in large plastic cups or even do big batches in large bowls. I recommend doing extra eggs. Some may not survive the experiment and even once the shells are removed the membranes are still quite thin and easy to break. Having lots of naked eggs will provide kids with plenty of opportunity to explore and learn with the resulting bouncy, rubbery eggs. Set the egg carefully in the container, pour vinegar over the egg until it is submersed. The egg may float, this is OK. Add a little food coloring to the vinegar. Now let it sit for 24 hours. Bubbles form immediately on the shell as the chemical reaction begins. 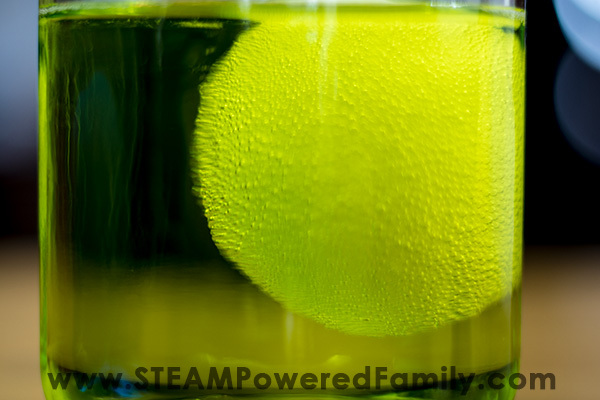 These carbon dioxide bubbles are formed by the vinegar reacting to the calcium in the egg shell. After about 24 hours you will end up with foam on top of your vinegar and the remaining liquid is mostly water. You will end up with a foam on top and eventually you will have only liquid water left. After 24 hours drain off the liquid and replace with fresh vinegar. You can also add more food colouring if you wish. It is very important to replace the vinegar to ensure there is enough acid for the chemical reaction to finish. What is the Chemical Reaction When You Place an Egg in Vinegar? After another 24 hours (2 days in total) your naked eggs should be ready! Carefully drain off the liquid and rinse your eggs under a gentle stream of water. The membrane is still quite thin and fragile. So handle with care and do it in a place that is easy to clean! What do you notice about the eggs? How do the eggs from the vinegar experiment feel compared to eggs still with their shells? Can you see anything moving inside? Try holding it up to a light or flashlight. How does the size of the naked eggs compare with eggs that have not been through the chemical reaction? Why Does The Egg Feel Rubbery After Being In Vinegar? Egg shell is basic and vinegar is an acid. When you place an egg in vinegar it reacts causing the shell to dissolve leaving only the rubbery membrane holding the egg together. If you are lucky enough to get some of the shell off a normal raw egg, you can see the membrane. What Can You See Moving Inside Naked Eggs? 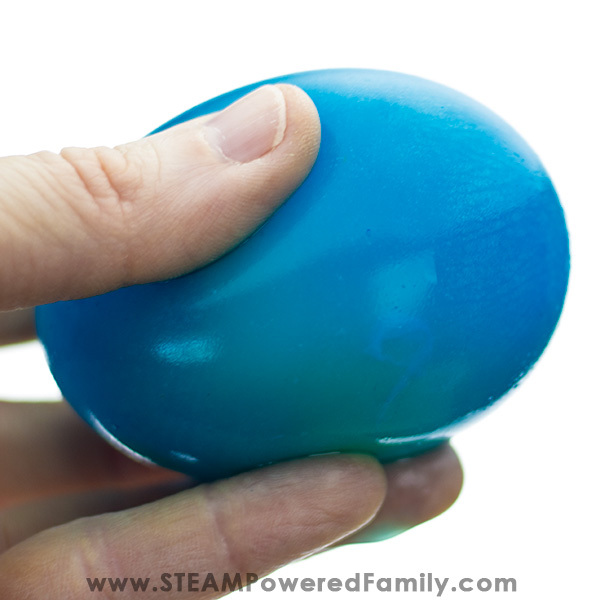 Hold the eggs up to a flashlight or bright light and move the egg around or gently squeeze it. You should be able to see the yolk and other parts inside the egg floating around. Why Does The Egg Get Bigger In Vinegar? Did you notice the eggs are larger than before you placed them in the vinegar? This is why we recommend using a wide mouth jar. Otherwise your naked egg could get stuck in the jar! But why does this happen? It’s because of a process called osmosis. Through osmosis some of the liquid (water) moves through the semi-permeable membrane into the egg. It does this until it reaches an equilibrium between the amount of water inside the egg membrane and the surrounding liquid. If it didn’t stop at equilibrium the egg would get so large it would eventually pop! 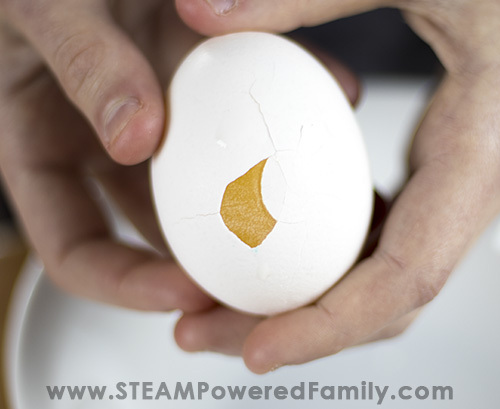 Since there is no hard shell to keep the egg small, it expands and grows. I recommend working over a large bowl or plate as kids explore the eggs. Undoubtedly, some will break. This isn’t the end of the world though, it just means it is time for some new lessons on cells. If you don’t have any broken eggs take a knife or tooth pick and gently poke the egg to rupture the membrane. The food dye travels through the membrane into the egg white (this is part of the osmosis process we discussed that also caused the egg to grow), but a special membrane around the yolk stops the dye from traveling into the yolk. This is a great visual for permeability and osmosis. But closer inspection shows that some very special parts of our egg have taken in quite a lot of the dye. 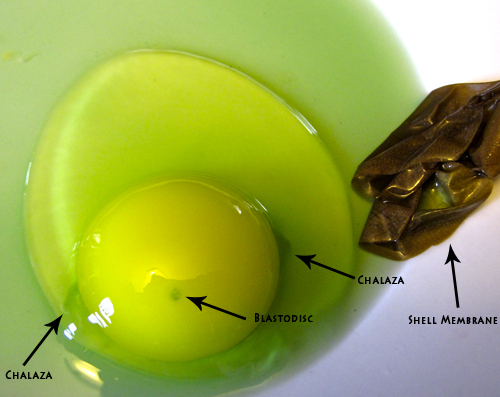 The chalaza, stringy bits on either side of the yolk that help to hold it in place, and the blastodisc, a circle in the middle of the yolk, this is where the sperm enters to fertilize the egg and is the nucleus of the egg (just like a cell!). Dying the egg makes it much easier to see all these parts of the egg compared to when we just cracked open a raw egg. Now kids can see the cells and structures more clearly. What happens if you let the eggs soak in vinegar for a week instead of only 2 days? Compare the differences. What happens if you boil the egg before placing it in vinegar? What can you change in your experiment to make the resulting egg more bouncy and less prone to breaking? Compare before and after. Take measurements, weights and work out how much the eggs changed during the experiment. What happens if you take a naked egg and place it in corn syrup? (Tip! The result has to do with the process of osmosis). 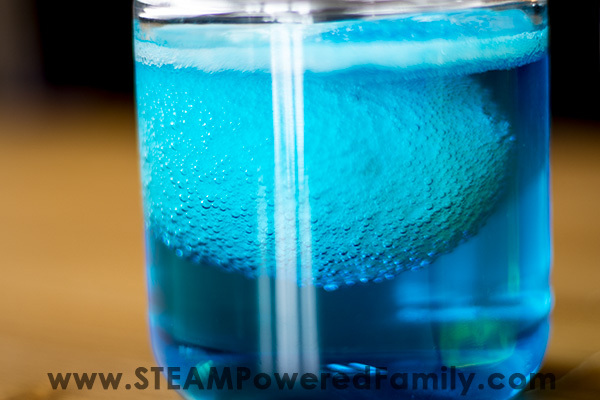 Explore osmosis further… What happens if you soak a naked egg in water? Don’t have time to do all of these experiments? Use your critical thinking skills and lessons learned from this experiment to predict what you think will happen. Create your hypothesis then do some research to see the answer when you have time, either by experimenting yourself or reading about experiments done by others. Candy Science – Making Chemistry lessons sweet! I’ve seen eggs bounce after putting them in vinegar. Our eggs splatted and didn’t bounce. Fun activity to discover more about cells! I’ve never heard of doing this before – pinned to try when my toddler gets a bit older! Very fun activity! We must do this! Fascinating! I’m dying to try this with my kids now. Thanks for sharing with the #made4kids linkup. This is really cool. First my class dipped it in vinegar for 1 day. They honey in one day. The honey made the egg shriveled. The we dipped it in food coloring for one whole day then it became a super big egg. I recommend teachers to do this one day. 3rd to 8th grade project.